People around the country and in the nearby towns muttered a great deal among themselves, but said very little to the outer world. They had talked about dying and half-deserted Innsmouth for nearly a century, and nothing new could be wilder or more hideous than what they had whispered and hinted years before. Many things had taught them secretiveness, and there was now no need to exert pressure on them. Besides, they really knew very little; for wide salt marshes, desolate and unpeopled, keep neighbors off from Innsmouth on the landward side. Hello and welcome to cooking fish with H.P. Lovecraft. I’ll take a look back at some of my favorite seafood adventures this past year, offer tonight’s recipe which uses roasted bones from a Walleye to create a Madhur Jaffrey/April Bloomfield chowder, all the while discussing the fish-people of Lovecraft’s “The Shadow Over Innsmouth,” and even take a look at contemporary philosophers exploring Lovecraft’s cosmic horror as an opening into object-oriented ontology. Away we go. 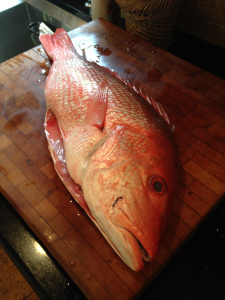 I certainly have enjoyed placing a fresh, Gulf Coast Red Snapper on my cutting board and admiring its salmon-orange coloring as well as the reddish-interior promising a clean, creamy, slightly salty taste. And then, of course, there’s looking eye to eye, the living and the dead sharing a moment; well sharing an intention I suppose, one which, though dead, the red snapper still shapes. There certainly is a strange kind of streak in the Innsmouth folk today–I don’t know how to explain it, but it sort of makes you crawl. You’ll notice a little in Sargent if you take the bus. Some of ’em have queer narrow heads with flat noses and bulgy, stary eyes that never seem to shut, and their skin ain’t quite right. Rough and scabby, and the sides of their necks are all shrivelled or creased up. Get bald, too, very young. The older fellows look the worst–fact is, I don’t believe I’ve ever seen a very old chap of that kind. Guess they must die of looking in the glass! I include this dish from Veracruz because red snapper is a delicious fish from the Gulf Coast that we share with our Veracruzan neighbors. 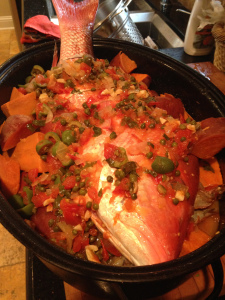 The recipe is so delicious and colorful that it has become popular in the Texas Mexican region. Note that there is no cilantro but parsley. This, with olives, black pepper, and briny capers, is similar to the Moroccan Tagine dishes and is another example of Arab influence on Texas Mexican cuisine. 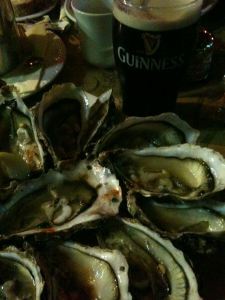 Of course, I’ve also enjoyed eating fish out, especially at my favorite restaurant in Houston, Coltivare. 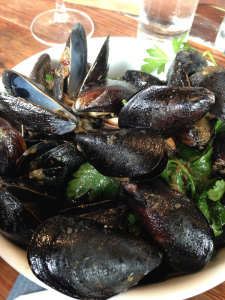 This may not sound amazing, but believe me, that was the best bowl of mussels I’ve ever eaten. 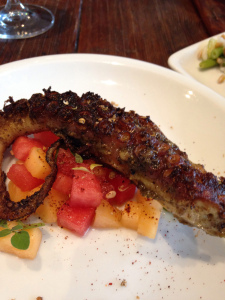 I’ve also enjoyed a charred octopus tentacle with corn, beans and tomatoes at Coltivare. 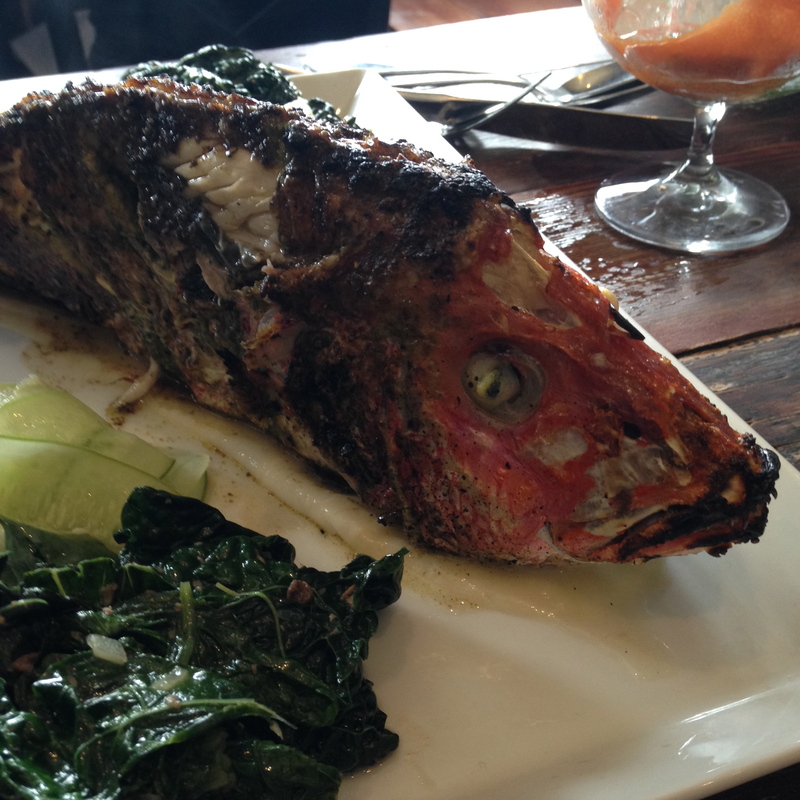 Not to forget their mouth-watering wood roasted Red Snapper with steamed garlic and sautéed greens. Which, again, affords a moment of looking into the eyes on the other side of the veil. However, I soon saw that my uneasiness had a second and perhaps equally potent source residing in the pictorial and mathematical suggestions of the strange designs. The patterns all hinted of remote secrets and unimaginable abysses in time and space, and the monotonously aquatic nature of the reliefs became almost sinister. Among these reliefs were fabulous monsters of abhorrent grotesqueness and malignity—half ichthyic and half batrachian in suggestion—which one could not dissociate from a certain haunting and uncomfortable sense of pseudo-memory, as if they called up some image from deep cells and tissues whose retentive functions are wholly primal and awesomely ancestral. At times I fancied that every contour of these blasphemous fish-frogs was overflowing with the ultimate quintessence of unknown and inhuman evil. No other writer is so perplexed be the gap between objects and the power of language to describe them, or between objects and the qualities they possess . . . Lovecraft is an anti-idealist whenever he laments the inability of mere language to depict the deep horrors his narrators confront, to the point that he is often reduced to hints and allusions at the terrors inhabiting his stories. A couple of days ago I laid my hands on a Walleye Pike and proceeded to lovingly stuff and cover it with cumin and coriander seeds, cloves and cinnamon, garlic and ginger, and tumeric, along with the required salt and black pepper–a Tandoori Masala Walleye, which proved to be delicate, fragrant and spicy. When the driver came out of the store I looked at him more carefully and tried to determine the source of my evil impression. He was a thin, stoop-shouldered man not much under six feet tall, dressed in shabby blue civilian clothes and wearing a frayed grey golf cap. His age was perhaps thirty-five, but the odd, deep creases in the sides of his neck made him seem older when one did not study his dull, expressionless face. He had a narrow head, bulging, watery blue eyes that seemed never to wink, a flat nose, a receding forehead and chin, and singularly undeveloped ears. His long, thick lip and coarse-pored, greyish cheeks seemed almost beardless except for some sparse yellow hairs that straggled and curled in irregular patches; and in places the surface seemed queerly irregular, as if peeling from some cutaneous disease. His hands were large and heavily veined, and had a very unusual greyish-blue tinge. The fingers were strikingly short in proportion to the rest of the structure, and seemed to have a tendency to curl closely into the huge palm. As he walked toward the bus I observed his peculiarly shambling gait and saw that his feet were inordinately immense. 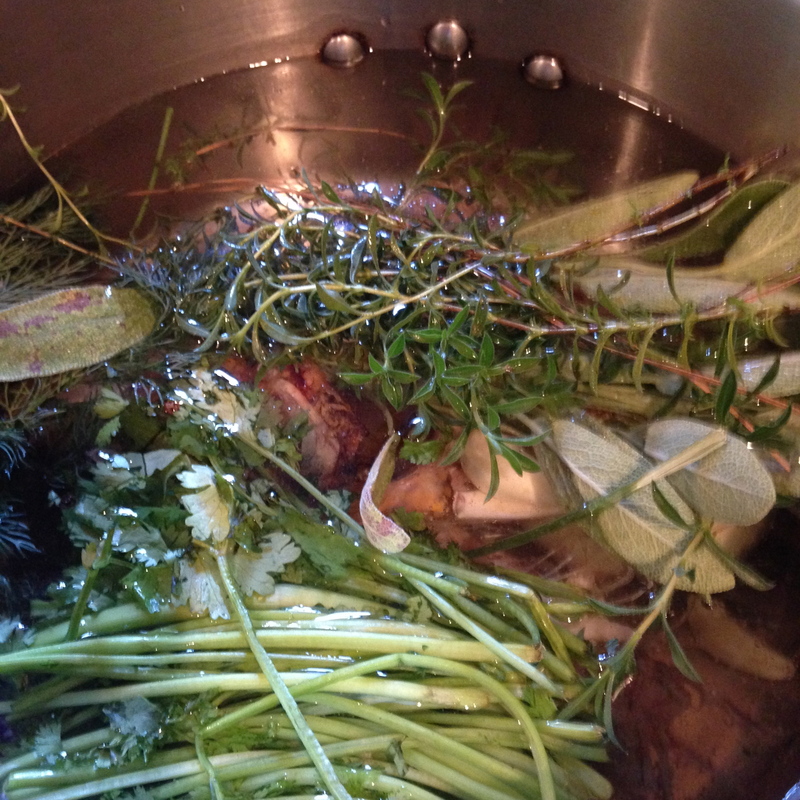 The next morning I set to work on my fish stock, using the left over bones, of course including the head, of the previous night’s feast, I added fresh sage and oregano from our garden, cilantro stems, onion with two cloves stuck in, black pepper, crushed garlic, bay leaves, and carrot tops. For most of the day all slowly simmered, bathing the house in a pleasant herbal, river fish smell along with a hint of those Masala spices. 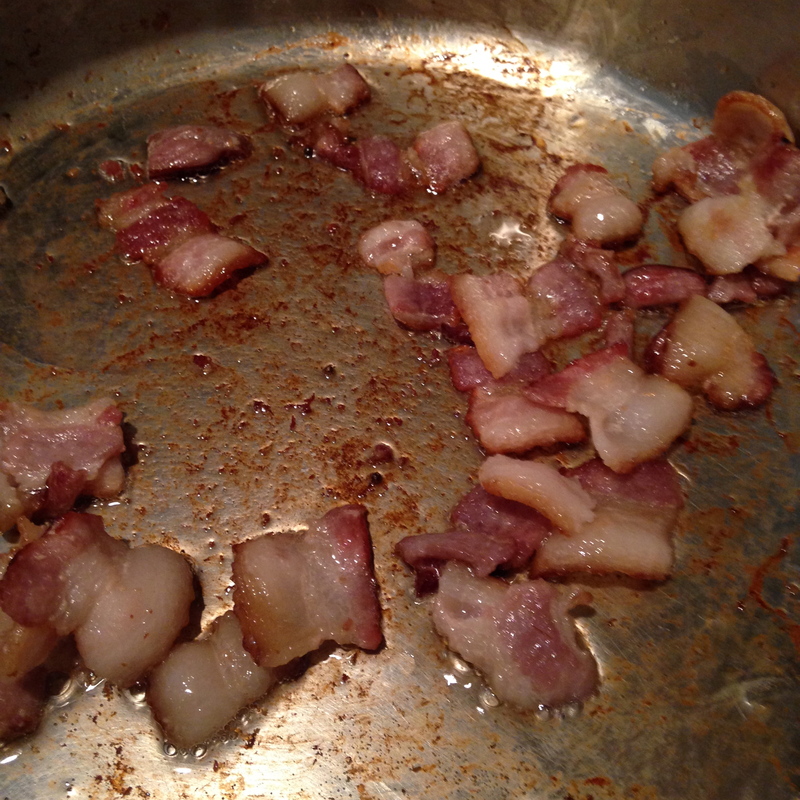 Later, in the afternoon I began with what every chowder must begin, bacon. 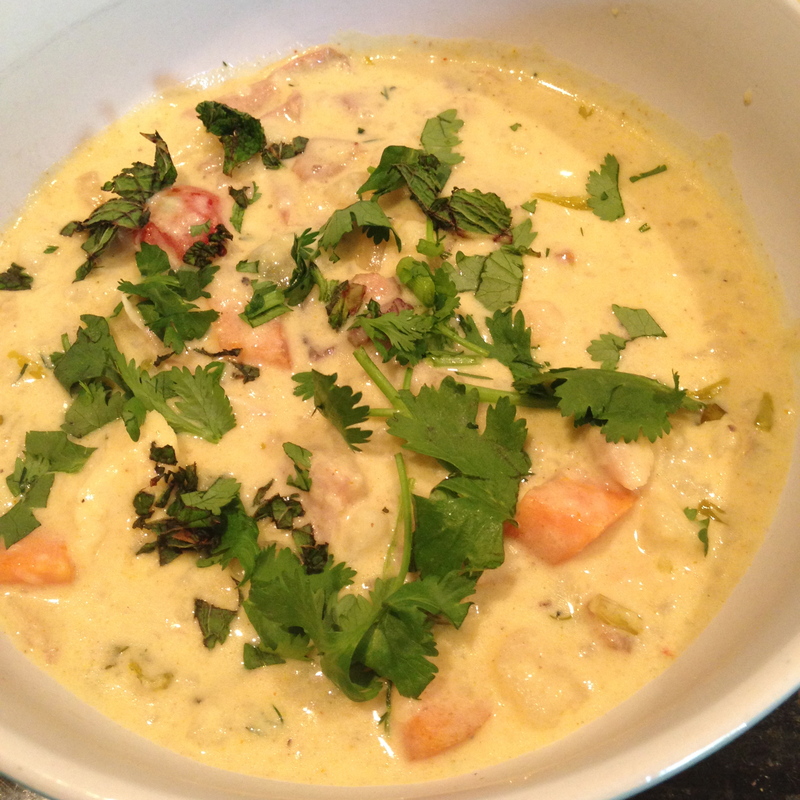 I’m combining April Bloomfield’s Smoked Haddock Chowder (a very liberal approach, meaning no smoked haddock) with Madhur Jaffrey’s spices in her Chicken Mulligatawny Soup (meaning, no chicken). 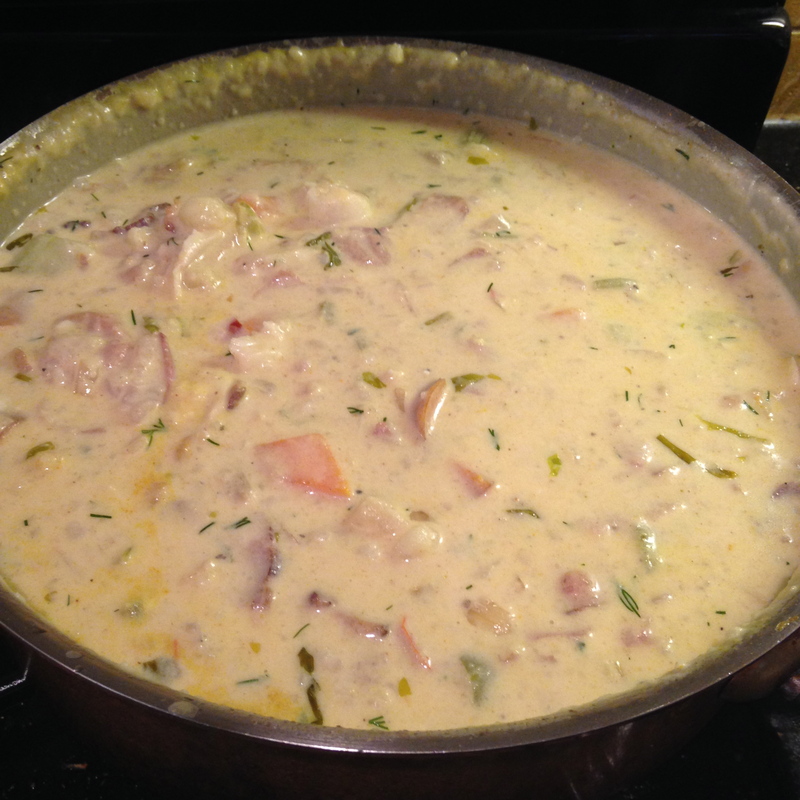 So as the bacon sizzles, and the stock continues to burp, I put parboiled red potatoes in a mixture of coconut milk, whole milk and heavy cream. Oh how it bubbles. 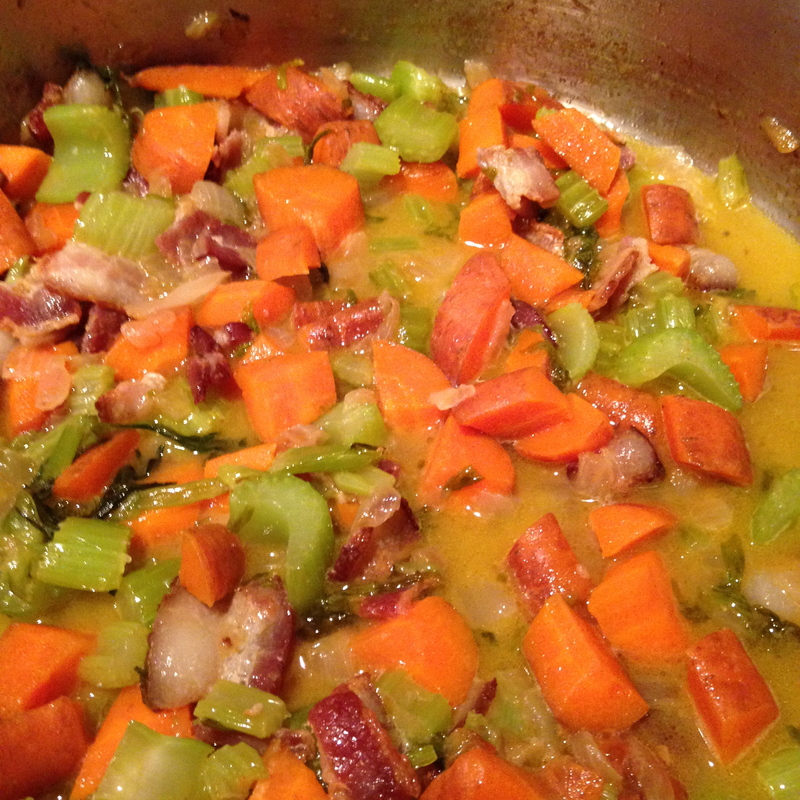 I’ve added onion, carrots and celery and a half-cup of Blanche de Bruxelles, a wheat beer from Brasserie Lefebvre. Let’s check back in with Innsmouth. 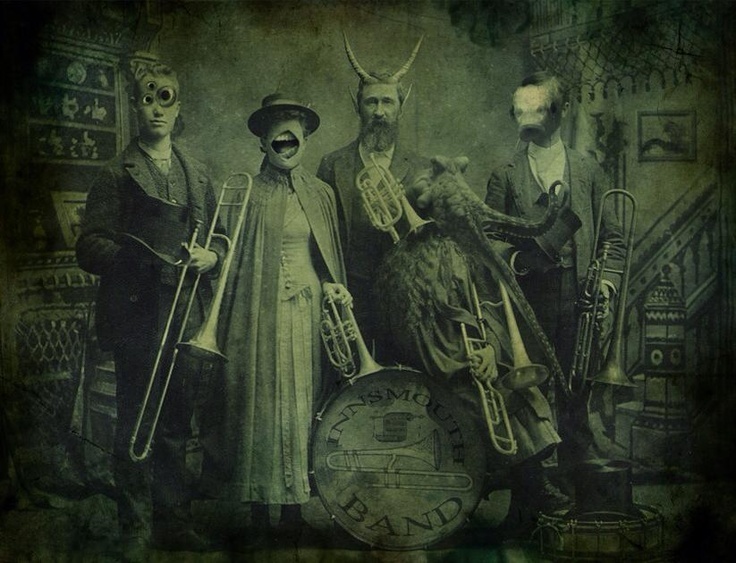 Courtesy of satyr, this is the Innsmouth Band, which given the nature of Innsmouth and the rest of Lovecraft’s view of New England, is about right. Which brings to mind what this band might sound like, maybe something like this . . . . 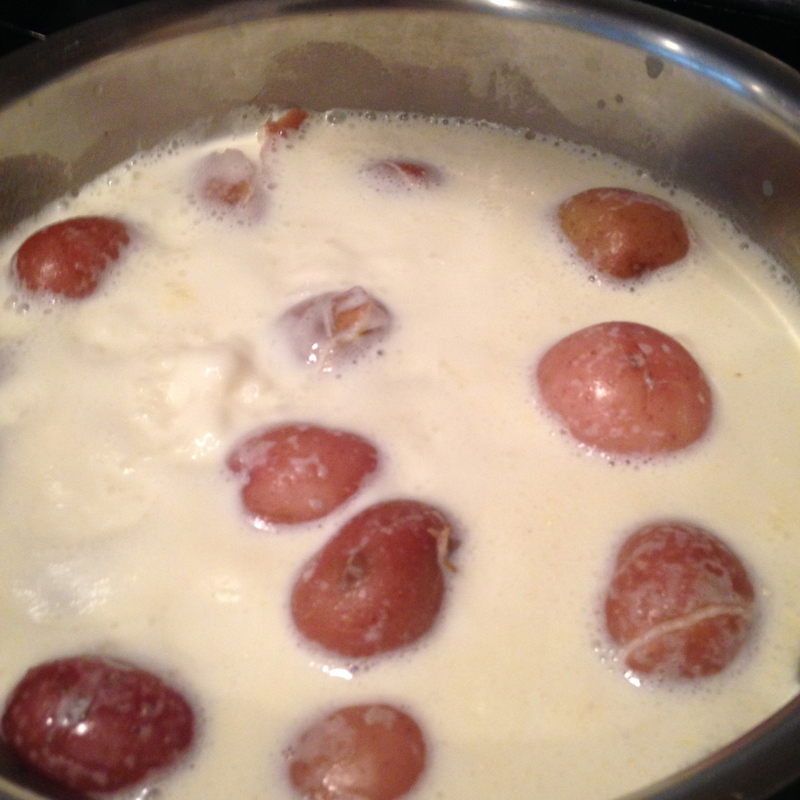 I add fish stock and the milk and potatoes–the potatoes at this point have fallen apart and all mixes together. 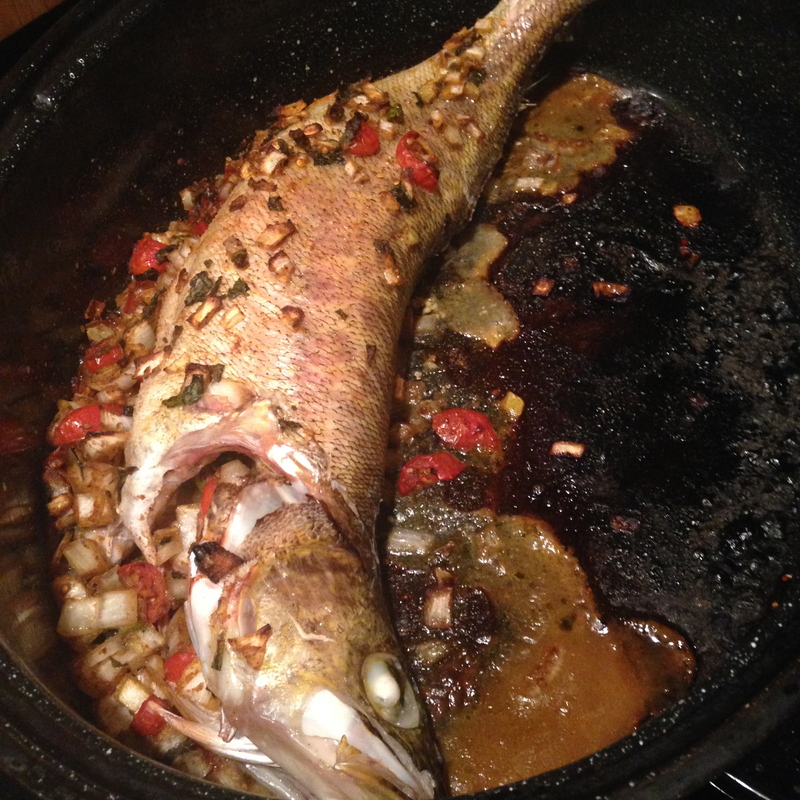 I’ve also added tumeric, garlic and ginger, cumin and coriander, and the left over fish from last night. Now it must percolate for a couple of hours. Back to Innsmouth. “Yew want to know what the reel horror is, hey? Wal, it’s this—it ain’t what them fish devils hez done, but what they’re a-goin’ to do! They’re a-bringin’ things up aout o’ whar they come from into the taown—ben doin’ it fer years, an’ slackenin’ up lately. Them haouses north o’ the river betwixt Water an’ Main Streets is full of ’em—them devils an’ what they brung—an’ when they git ready. . . . I say,when they git ready . . . ever hear tell of a shoggoth? . . .
What is a shoggoth? Well, let Mr. Lovecraft in “At the Mountains of Madness” explain. And now it’s serving time. The addition of the tumeric with all the milk and cream allows for a deep, mustard-yellow color. With the Indian spices meeting the traditional European approach, there’s a wonderful full range of flavor. So as the family sits down to eat its chowder, I leave you to finish reading “The Shadow Over Innsmouth.” I suggest following the link and reading it online, or even better, if you have a hardcover or paperback edition of Lovecraft, sit up in bed, drink your chowder, and read about what’s happening under the sea and what it all has to do with fish, elder gods, and definitely misshapen things that go bump in the night. Next Next post: Roast Shoulder of Lamb with Garlic and Potatoes – As bucolic as it gets.